AP Schools Radio Lessons Schedule 2018-19 - Vindaam Nerchukundaam Programme Dates : AP SSA announced Radio Lessons in AP Primary Classes Vindaam Nerchukundaam Programme Dates from 14th Sep, 2018 to 29th Mar , 2019. Radio Lessons 2018-19 Schedule - Vindaam Nerchukundaam Programme for AP Schools. Radio lessons Schedule of 14th September 2018 to 29th March 2019. 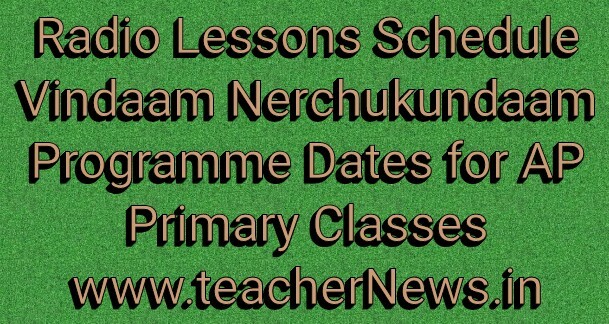 AP Primary Classes Vindaam Nerchukundaam Radio Lessons 2018-19 "Vidaam Nerchukundam” Radio Programme for Primary classes from 14th Sep, 2018 to 29th March, 2019. The lessons are scheduled from 11.00 am to 11.30 am from every Monday to Friday from all India Radio Stations in Andhra Pradesh. Download the Radio Schedule, Print and Supply the radio Schedule to all the Head Masters of the Schools concerned with instruction to follow the guidelines and schedule. The expenditure is to be met from the DPO Management Cost for the year 2018-19. All the Project Officers are hereby informed that, the "Vindam Nerchukundam" Radio Programmes / IRI Lessons for primary classes are scheduled to broadcast from 14-09-2018 to 29-03-2019. Vindam nerchukundam radio lessons 2018-19 Dates for AP Primary Classes. AP radio lessons 2018-19 radio lesson time table, radio lessons in telugu radio lessons schedule 2018-19.